Ana Talukder imprints the initials of you and your partner, surrounded by the names of your loved ones. 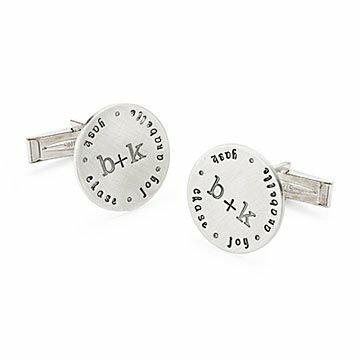 You carry your family in your heart wherever you go, but these personalized cufflinks let you wear your heart on your sleeve. Designer Ana Talukder imprints each sterling silver disk with the initials of you and your significant other, surrounded by the names of your loved ones, whether that is children, extended family, or even your pets (up to 30 characters). Make them your new favorite accessory, or give them as an unforgettable Father's Day or anniversary present. Handmade in Seattle, Washington.